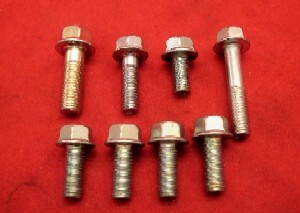 These are the bolts that attach the engine's front cover to the block. NOTE: One of the necessary bolts has been discontinued by Mitsubishi, so we have substituted an industrial fastener for that location. NOTE: Photo is for display purposes and depicts a 6-bolt kit. 7-bolt kit similar.